Students and teachers across Sangamon, Menard, and Logan counties are opening their classrooms, minds, and hearts to new and exciting things this spring by incubating eggs in their elementary classrooms. The University of Illinois Extension 4-H and Ag in the Classroom programs are continuing their mission to educate and enlighten students in the areas of agriculture, science, technology, and food production. 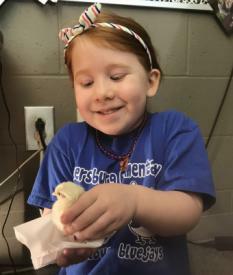 This year the program has already sent out eggs and incubators to 31 classes who were successful in hatching more than 200 chicks, which will go to area 4-H families to be raised on area farms. Next month a record 59 classrooms will be starting the process all over again. Each year for more than 25 years, the University of Illinois Extension has been the source for education and outreach for teachers across the area for this wonderful hands-on project. If you teach in an elementary school in one of our three counties, and would like to be put on the mailing list for inclusion for the 2018-2019 school year, please contact Sharon Lounsberry, 4-H Program Coordinator, at slounsbe@illinois.edu or 217.872.4617.